I recently sent out an S.O.S. to my MUFON Overlords, requesting promotional materials for my upcoming appearance at the Milwaukee Paranormal Conference, and boy, did they come through! 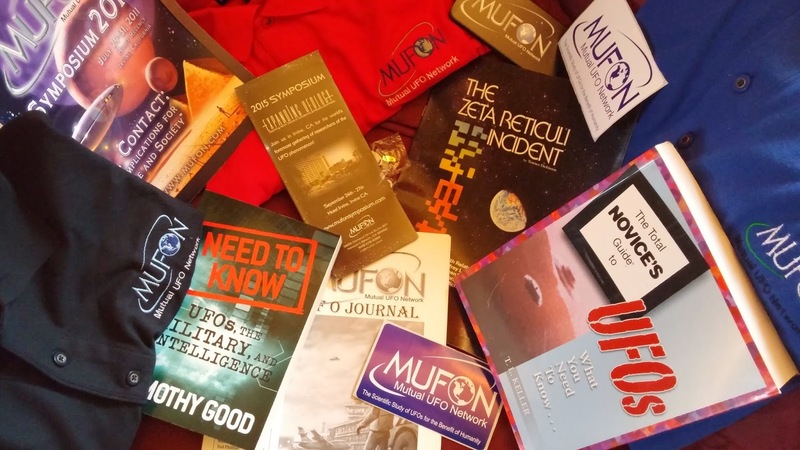 You see, my "payment" for being a presenter at the conference is space for a free tabletop display promoting MUFON. I would have preferred cold, hard cash, or a free lunch, but what can you do? Books! Jewelry! Stickers! Magazines! iPhone cases! Special reports! Apparel! 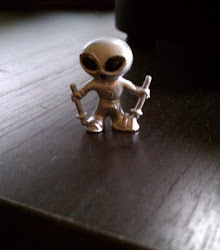 They pretty much cleaned out the MUFON storage container and shipped its entire contents to me. I think it's pretty easy to see which vendor table will have the heaviest traffic in Milwaukee come June 6th... This swag is so cool, my daughter is going to wear one of the polo shirts to high school tomorrow. Think about that. Speaking of the Milwaukee Paranormal Conference, I got an email the other day that made me realize that I may not be marketing my appearance at the Conference as aggressively as I might... The email was an announcement for the MUFON 2015 Symposium this coming September in Irvine, CA (BTW: Seeing as how I now possess every brochure for the Symposium that MUFON had printed, you might as well direct all your questions to me...). I immediately went to the "Speakers" page to see if I would be speaking at the MUFON Symposium, and apparently I'm not. But I read a couple bios of the speakers who are appearing, and quickly realized that my promotional bio for the Milwaukee event is pretty pathetic by comparison. "Mark O’Connell has written several episodes of Star Trek: The Next Generation and Star Trek: Deep Space Nine — one of which, the DS9 episode “Who Mourns For Morn?”, was recently named by Hugo-winning science fiction writer Charlie Jane Anders as #72 on the io9.com list of the Top 100 Star Trek episodes of all time. "Mark has had feature film projects in development with Disney, DreamWorks Animation, Launchpad Productions, Barcelona Films and Al Ruddy Productions. 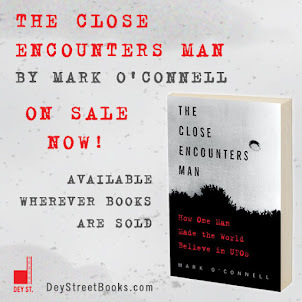 He currently writes the UFO blog “High Strangeness” at www.highstrangenessufo.com, is writing the authorized biography of UFO scholar Dr. J. Allen Hynek, and is set to make his reality show debut in 2015 in “Monumental Mysteries” on The Travel Channel. Mark lives in southern Wisconsin with his wife." Sure, it reads ok, but only just. "Mxxx is an expert in many areas. He possesses insurmountable knowledge and information. He could speak for years and never tell you all that he knows." Damn! Damn! Now, that's a bio! I will know better when -- or if -- I am ever invited to speak at a UFO Conference again. 'Cause, I'll tell you what: I can speak for years and never tell you all that I know. Can you send me a couple MUFON stickers?